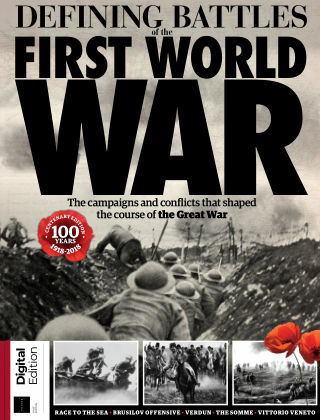 With Readly you can read History of War - Defining Battles of the First World War and thousands of other magazines on your tablet and smartphone. Get access to all with just one subscription. New releases and back issues – all included. "On 25 December 1914, the trenches along the Western Front fell silent. For one miraculous day, foes turned into friends, with sworn enemies swapping cigarettes, playing football and telling jokes. By 26 December, thousands of these men lay slaughtered where they’d mingled the day before, any hopes of a war over by Christmas abandoned. In almost four and a half years of conflict, no such truce happened again. In the History of War Book of the Defining Battles of the First World War, uncover the pivotal skirmishes of the Great War, from Marne to Megiddo. Discover how the Gallipoli campaign shaped the war, find out how the Somme became the bloodiest battle in history, and learn why the Hundred Days Offensive came to end the bloodshed"